The decline in breeding Little Grebes was one of the surprises of this survey, as it had not been noticed or commented upon previously. Compared to the First Atlas, the species has been lost from many of their former breeding sites in central and south Wirral, south of Chester and the region from Northwich to Congleton. There have been gains in scattered sites across the county, and a noticeable increase in occupied tetrads in the eastern hills; in some areas there appear to have been minor redistributions from one tetrad to another, but the net effect is a loss of 19 tetrads from twenty years ago. 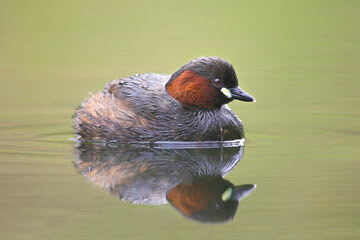 There could be several reasons for the decline in breeding records of Little Grebe. Their food – mainly aquatic invertebrates, especially larvae, and small fish – puts them in competition with the larger fish favoured by anglers, so ponds that have been taken over by fishermen are often inimical to this species, over-stocked with fish and denuded of marginal vegetation. Also, their favoured smaller waters are perhaps those most affected by unsympathetic water use – river engineering, pollution, agricultural run-off and over-abstraction. Brown & Grice (2005) note that the future of the Little Grebe is inexorably linked to the appropriate management of our lowland wetlands and that we should make greater efforts to monitor trends in breeding numbers: this comment should surely apply to Cheshire and Wirral. As the Little Grebe has declined, Great Crested Grebes have spread, but there does not seem to be direct competition between them. Bell (1962) said that Dabchicks are on many waters which are too small for Great Crested Grebes but Boyd (1951) had ‘never seen a nest on the little marl-pits as are occupied by Moorhens’. In this survey, 66 tetrads had records of Little Grebe and not Great Crested; 64 tetrads had records of Great Crested Grebe and not Little; and 60 tetrads had records of both species. The submitted habitat codes show clearly the Little Grebe’s bias towards smaller standing waters: 12 pond; 50 small water-body; 48 lake/ unlined reservoir; 4 lined reservoir; 14 sand pit, etc; and 5 on linear watercourses. Little Grebes are secretive, but their far-carrying trilling ‘song’ – a high-pitched whinnying – readily betrays their presence. It seems that some observers were not familiar with the birds’ trilling calls, however, so perhaps some birds were missed, and a disappointingly high proportion of records was of birds seen in suitable habitat only. Birds return to their breeding areas in the New Year. Little Grebes have a protracted breeding season (February to September) although most eggs are laid from late April to late June (Moss & Moss 1993). The nest, on a floating platform of vegetation concealed in emergent vegetation, is vulnerable to fluctuations in water level, either flooding following heavy rain, or being left stranded in drought. Once the chicks have hatched the birds tend to become more visible, and 55 out of the 61 two-letter codes were sightings of adults with young. The striped chicks are often carried on the adults’ backs, although less frequently than in the larger grebes, and some parents build brood platforms for their young. Nationally, the species has declined rapidly on linear waterways but that wider populations (including birds on small still waters) are healthy. In Cheshire and Wirral, some tetrads hold more than one pair and the county population may lie in the range 150-200 pairs. With the large number of waters in the county, Cheshire would perhaps be expected to hold an even larger population of this species. A thorough survey of breeding numbers would be useful.